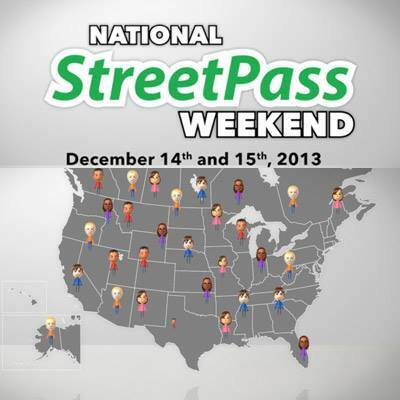 Nintendo has announced a National StreetPass Weekend for December 14 and 15 in North America. For two days, all Nintendo Zones throughout Canada and the United States will communicate with each other (! ), mixing up the StreetPasses they receive and redistributing them to other Nintendo Zones. This means players can receive passes from all over the continent, filling in their map and logging more players than would be possible otherwise. To find a Nintendo Zone close to you, check out Nintendo’s official Nintendo Zone website. I thought this would be some lame event that no one cares for but that IS cool! Neat for people like me who only get the same local StreetPasses from the same 5 people over and over at Nintendo Zone. Neat! I get a fairly wide variety of people from the same hot spots, but this is going to blow things open really wide. Now what reason do I have to visit all 50 states? None reason. Instead I will just sit at home and stare at the wall, counting down the minutes of this life. Thanks for nothing, Nintendo. It's an interesting idea. Beats just "You should take your 3DS out this weekend!" Because YOU SHOULD BE DOING THAT ALWAYS. Like I needed another excuse to go to McDonald's. Even though it doesn't affect me AT ALL, I kinda agree with JKR here. Wasn't part of the ALLURE of this stuff and it tracking where you've run into people being the "Gotta Catch 'Em All" aspect of it, and "YES, JUST GOT A GUY FROM HAWAII!" or whatever? It does seem kinda..cheap? for someone who is trying to avoid stuff like that. I know that isn't a concern for anywhere near the majority of users, but I'm sure someone out there is bummin' just a little bit. @Mr_Mustache Well, I go all over town in a very very diverse city (Or rather, set of cities, the Bay Area) and I never seem to get anyone who doesn't have their 3DS set to California, whether I'm going to a mall, riding on a train or anything. Hell, I don't get that many Street Passes, period. Thing needs like a 2 mile range or something. Or I could creepily hang around schools! Except it doesn't work. I've taken my 3DS out very VERY often and have yet to get StreetPasses from outside the province I live in. I've been to Toronto once and even that only got me a single StreetPass. Nintendo implemented this relay station because StreetPasses were not working as well as they had hoped. Plus if they do these events more often, it makes people aware of that feature and hopefully has more taking it out to Nintendo Zones and further diversifying the StreetPasses that are sent around. I've gotten a few people from the US, but 99% of my StreetPasses are from my home province. I do agree that this feature kind of ruins the appeal of StreetPasses, though. There's just something neat about passing someone who also has a 3DS. I can't imagine getting all off the accomplishments in the Mii Plaza otherwise though. It would still take years before that would be possible for me, assuming I don't go to some major meetup or gaming event, none of which happen anywhere near here. If I recall, Gui had a pretty hefty collection of places, the most diverse I've seen/heard about. I could be wrong though..
Bottom Line: come to some NW Meetups!! You guys should come visit Detroit. I get StreetPasses all the time, and I've got my United States Map completely filled out. I traveled a ton to places where a lot of gaming nerds gathered, like PAX East or E3. Needless to say, that helps, but not everyone has this chance. So I don't have anything against this initiative: people can always turn off their wireless or leave the 3DS at home on that week-end. Those who can't travel a lot and want the novelty of streetpassing someone from far away, can. I Streetpassed someone from France yesterday. Legit. Why doesn't Nintendo bring this sort of thing here though? Sigh. I could care less where the street passes come from, as long as I can get more pink puzzle pieces! France, eh? Nice! The farthest I've StreetPassed someone was a girl from Japan. And this was way before this Relay System was in place! It was pretty cool. You should StreetPass me more! Yeah, I got a couple from Japan, a handful from the US and Canada, and a Kiwi. I think I might have a Brit too. Getting the 'All Regions' accomplishment is a bit easier here as we only have the 6 states and 2 territories- But I'm still missing someone from Tasmania and the Northern Territory. Boo. Well, if it makes you feel any better, I don't have anyone from Tasmania or the Northern Territory either. This could be interesting. I wonder if this'll work with my homemade one.